In a recent address to the National Press Club in Australia,1 Professor Margaret Gardner, Chair of Universities Australia and President and Vice-Chancellor of Monash University, reiterated the significance of research and scholarship and the creation of new knowledge to not only educate our future citizens but also contribute to the public good. Knowledge, Professor Gardner stressed, is key to fostering the civic life of communities and to fuelling social and economic forces that in turn, transform societies. And of course, new knowledge shapes and is encapsulated in curricula. The range of papers in this edition of Curriculum Perspectives draws on international research and research in Australia to cast light on those issues associated with the development of knowledge through curriculum documents. This volume starts off with David Golding and Kule Kopsick’s analysis of the literature syllabi of Cambridge Assessment International Education (CAIE), an international education organization that determines curricula and conducts examinations for nearly one million students annually across 9 global regions. The authors point out that while CAIE describes its syllabi as internationalized and free from cultural bias and discrimination, little research has been conducted to confirm or reject such claims. Using a framework of postcolonial feminism and postdevelopment theory, Golding and Kopsick analyzed author representation in CAIE literature syllabi to reveal potential colonial and patriarchal dimensions. They argue that the CAIE literature syllabi reflect the continued legacy of colonial relations between British education and the Global South. In the next paper, Altay Eren and Güler Çetin examine the relationships between beliefs about the teaching profession, curriculum orientations, and sense of personal responsibility, with the intention of exploring the mediating roles of curriculum orientations of a cohort of pre-service teachers from Turkey. 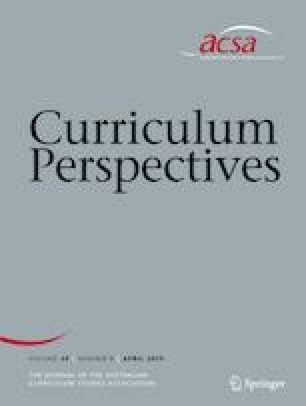 The authors contend that pre-service teachers’ beliefs about the teaching profession, curriculum orientations, and sense of personal responsibility for the diverse and challenging aspects of the teaching profession should be interpreted based on the mediating roles of their curriculum orientations. Continuing the focus on pre-service teacher education, Caleb Chidozie Chinedu, Wan Azlinda Wan Mohamed, Abdurrahman Ogbonnia Ajah, and Yalwa A. Tukur examine the significance of curriculum reorientation in a teacher education program in Kuala Lumpur, Malaysia. The authors focus on the prospects of technical and vocational education (TVE) programs in preparing pre-service teachers for sustainability. The findings suggest that the TVE programs in the authors’ case study do not substantially reflect sustainability and, as such, limit the programs’ prospects to prepare teachers for efficiently undertaking teaching tasks for sustainability. The last paper in the set of research articles in this edition focuses on the teaching practices of a group of senior physical education teachers in Queensland, Australia as they work from the prescribed syllabus. The findings indicate that the participants in this study used a limited range of teaching styles in their lessons, despite the fact that the Queensland Senior Physical Education Syllabus prescribed a specific range of styles to be used. Indeed, the authors, Brendan SueSee, Ken Edwards, Shane Pill and Thomas Cuddihy, conclude that the aims, objectives and outcomes (including higher-order thinking skills), as described in the syllabus, were not being met. 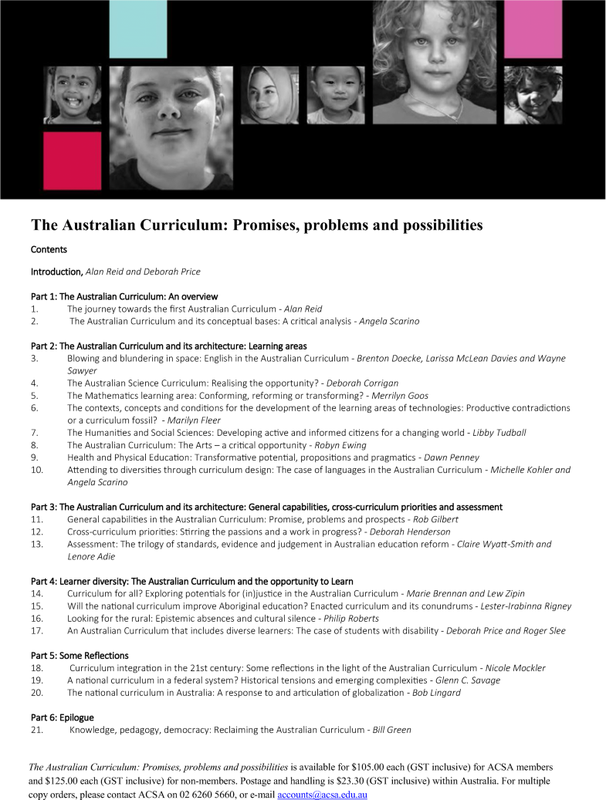 Over the past decade, Curriculum Perspectives has published a range of papers about the strengths and weaknesses of the development of the Australian Curriculum. Notable in these debates is the concern that there has been scant consideration of the theoretical principles underpinning this attempt at national curriculum reform. By way of contribute to this curriculum scholarship, Angela Scarino’s paper in the Australian Curriculum section of this edition, questions the conceptual base of the Australian Curriculum, by considering five interrelated aspects. These aspects are the view of learners and their lifeworlds; the view of learning; the view of knowledge and knowing; the view of the curriculum as a whole, and finally, the processes of development, consultation and achieving consensus. Scarino’s paper provides a powerful argument for why consideration to the conceptual bases (plural) places the curriculum development process on a stronger footing. Moreover, she contends it also opens the space for the intellectual work of comprehension, discussion, contestation and reconceptualization about the most crucial matters in education. As this paper is a revised version of Scarino’s chapter in The Australian Curriculum: Promises, Problems and Possibilities,2 it serves as ‘taster’ for this recent publication,3 from the Australian Curriculum Studies Association (ACSA). In Australia, the importance of Outdoor Learning in the curriculum was finally recognised by the independent statutory authority responsible for the development of a national curriculum, the Australian Curriculum and Assessment Authority (ACARA), in 2017. The Point and Counterpoint section of Curriculum Perspectives continues the focus of the previous edition (September, 2018) on why young people are entitled to learn outdoors and the creative ways in which outdoor pedagogy can be realised. Guest edited by Tonia Gray, the assembled papers provide a global overview of what curriculum change-makers are doing to inspire, critique, stimulate, appraise, and guide their work. Collectively, the papers in this edition provide insights into some of the key factors influencing global trends as well as critiques of issues arising from what is being undertaken to support young people’s engagement with outdoor learning in nature across a range of contexts. Two reviews are included in the Book Review section. Chrystal Whiteford explores how Reconceptualising Maths and Science Teaching and Learning reports on the project Reconceptualising Mathematics and Science Teacher Education Programs (ReMSTEP) in Australia. She examines its insights into the mathematics and science education sector and the role ReMSTEP has played in securing positive change for stakeholders. Whiteford contends the book provides thought provoking insights, together with important learnings to advance the sector. In the next review, Kathe Kirby examines why we need to improve young Australians’ capacity to engage more explicitly with our Asian neighbours as it is presented in a series of chapters from contributing authors in Asia Literacy in a Global World - An Australian Perspective. Kirby suggests the book plays a useful role in progressing discussions about Asia literacy. We are always seeking reviews of good books, so please consider sharing your review of a worthwhile publication so we can consider it for Curriculum Perspectives. 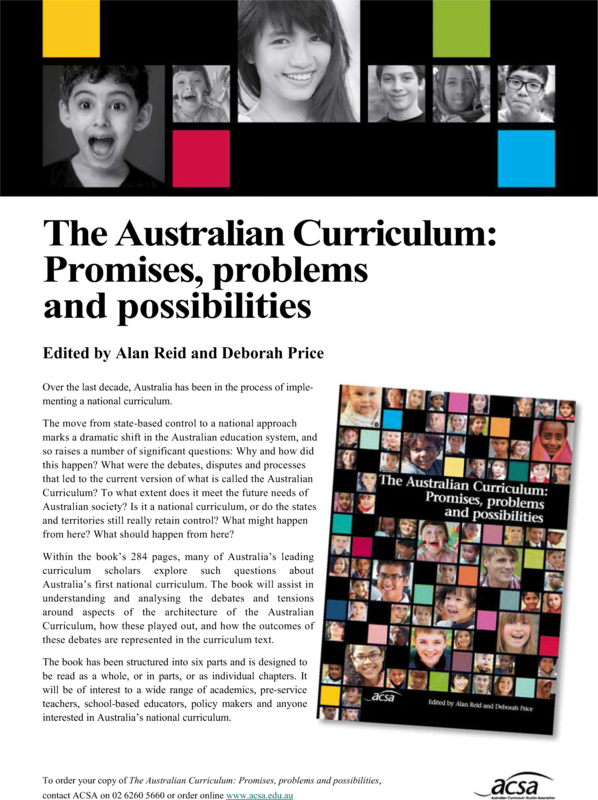 Finally, a flyer for The Australian Curriculum: promises, problems and possibilities is included in this edition - please share it with your curriculum colleagues. The book was launched at the excellent 6th World Curriculum Studies Conference (IAACS2018) that was convened under the auspices of the International Association for the Advancement of Curriculum Studies (IAACS), and co-hosted by ACSA and the Australian Association for Research in Education (AARE). Gardner, M. (2019). ‘A higher purpose: universities, civic transformation and the public good’, National Press Club of Australia, Canberra, ACT, Australia, 27 February. Reid, A., & Price, D. (Eds. ), (2018). The Australian Curriculum: Promises, Problems and Possibilities. Canberra: Australian Curriculum Studies Association.